This month marks the 30th anniversary of the adoption of the Law of the Sea Convention. July will mark 18 years since the 1994 Agreement on Implementation, which modified the Convention to resolve US objections, was opened for signature. Eight years have passed since Senator Lugar convened the first round of hearings on the Convention in the Senate Foreign Relations Committee. 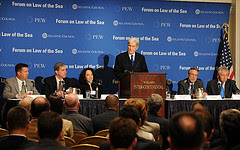 Working toward US accession to the Law of the Sea Convention (prior posts) is not a task for the impatient, but an event held yesterday (May 9th) suggests that this pace is about to change. The outlook for US accession to the Convention improved sharply this week with a high profile event organized by the Atlantic Council and the Pew Trusts. Co-chaired by former senators John Warner and Chuck Hagel, the event gave equal billing to economic and national security interests in the LOS Convention. In the opening panel, representatives of the US Chamber of Commerce, the American Petroleum Institute, Lockheed Martin and Level 3 Communications addressed the economic opportunities and other benefits that would be opened up for American companies by US accession to the Convention. The second panel addressed new security issues. Heather Conley of CSIS focused on international transportation, national sovereignty and boundary resolution issues in the Arctic. John Nagl from the Center for a New American Security addressed navigation, energy and resource security issues worldwide. John Norton Moore focused on the increase of national sovereignty over the seabed and its resources that would come with accession. The event was particularly notable for the stature of the people who made the case for the Convention. In addition to John Warner and Chuck Hagel, former Senate Majority Leader Trent Lott, who now represents Shell Oil and Lockheed Martin’s interests in joining the Convention, sat in the front row and spoke with attendees about the tactics of senate approval. Admiral Robert Papp, the Commandant of the US Coast Guard, gave a strong and personal endorsement. After lunch, the meeting closed with keynote presentations given by the Chairman of the Joint Chiefs of Staff, General Martin Dempsey, and by Secretary of Defense Leon Panetta. The LOS Convention has been a political lightning rod in the past, so it might seem an unlikely candidate for action in an election year, particularly in the summer before the general election. But there are some good reasons for Senate supporters to act on the opportunity now. First, support is bi-partisan, cross sectoral and high level and it addresses economic issues at the time when they are at the top of the nation’s agenda. Second, leadership is coming from Secretary of State Hillary Clinton, Secretary of Defense Leon Panetta and Chairman of the Joint Chiefs of Staff General Martin Dempsey, all of whom are respected by members of both parties in the Senate. (In light of the partisan relationship between the President and republicans in the Senate, the White House keeping a low profile on the LOS Convention.) Finally, the once-powerful coalition of opposition groups that focus on ‘go it alone’ unilateral security approaches, opposition to the United Nations and to economic regulations and promotion of "socially conservative values” has lost cohesion and has been markedly less effective in organizing opposition this year. And with low expectations for Senate action on other issues, floor time may be available before the August recess for even a prolonged period of floor debate. The final announcement of the event was the establishment of the “American Sovereignty Campaign,” an initiative to marshal support from all sectors of the public to press for Senate approval and US accession to the LOS Convention in 2012. The campaign’s website is now live. You can learn more about the May 9th event and other activities by visiting the campaign's website. For the next steps, watch for the Senate Foreign Relations Committee to build on the support demonstrated at the May 9th event. A series of hearings are expected in the near future, followed by preparation of a draft resolution of advice and consent to resolve outstanding concerns of senators, then a move to the full senate for the long-awaited floor debate and vote that will come more than 30 years since the original adoption of the LOS Convention.